Pods, Pods, Pods… Salt Nic, Salt Nic, Salt Nic. The industry has made such a huge shift lately to these quick and easy pod systems with hard hitting Salt Nic juice. We get it, it’s easy, they are very pocketable. With so many on the market it’s hard to choose and a new system comes on the market every other week. Flavour is still a huge factor but refill ability, cost to run, and battery performance are huge factors in what makes a winning system. We haven’t reviewed in a bit, most likely because we too have got up in this easy world of fill a pod, and grab & go. Gone are the days of coil building, wick changing, squonk bottle refilling… We hope it returns, but these tiny little rigs make it hard to ignore the connivence. The Justfog Minifit is one of the tiniest systems on the market and it has been widely adopted making it easy to find both the system and replacement pods (being able to source pods easily is a huge factor in which system you choose). The design isn’t super exciting, it pretty much looks like a USB stick. But the performance and easy of use make up for the rather ugly appearance (the giant logo on the side doesn’t help either). But this little puppy will keep any vaper happy with the right juice strength and access to a charger half way through the day (you’ll get about half a day per full battery charge, it charges in about an hour or less). Flavour is quite good, the Minifit is a little dated in pod system terms at this point (there are more flavourful systems out at this point). However the form factor is what keep the Minifit relevant in the market, there is nothing even close in size. The draw is MTL that borders on a Restricted Lung Hit. It works, and should be a great draw for new vapers as well as us more experienced chronics. The vape isn’t super cool or warm, it’s sort of just right. The position of the Airflow intake holes (2) are quite close to the fire button and need to be watched for that you don’t cover with your finger at times. BTW the fire button has a really nice clicky sound and feel to it. Pods last about 1-2 weeks depending on the sweetener content of your liquid. Replacements cost around $15-20 for a pack of 3 that should get you through a month a more. And with the system costing under $30 this makes for a pretty cost effective vape solution. Sure pods are pods, some can perform not as good as others, they can gurgle at times, be a mess if you over fill, but these Minifit coils are great for the most part. If they sit for a couple of days you make find they flood a bit, but clear up with a little shake and vape. Fit & Finish is acceptable for the price point. The system is light weight and has a lot of plastic parts, so sure it doesn’t feel premium, but either is the price. The 3 LED battery/charging level lights are nice and bright and work very well. The USB charging port is also nice and solid. 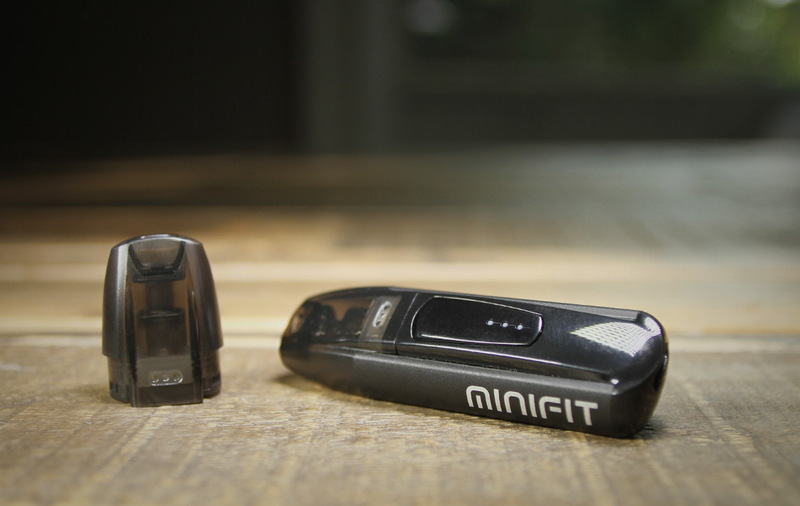 The Minifit is a great little system that is perfect for some serious stealthy vaping at a cost you can’t ignore. And getting your hands on replacement pods or systems is super easy with it being carried almost everywhere. Here is to hoping we get a v2 or something similar soon. The Justfog C601 just doesn’t live up to this original system. But really who cares when the Minifit is still around to be enjoyed. Grab yourself one!